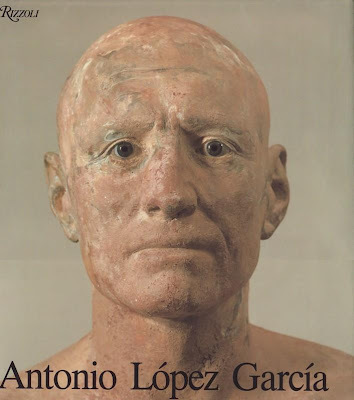 Bookride: Antonio Lopez Garcia...Rare Rizzoli Art Book. Michael Brenson & Francisco Calvo Serraller, Edward J. Sullivan. ANTONIO LOPEZ GARCIA.Rizzoli, NY 1990. $1400-$2000 / £700-£1000 ISBN: 0847812499. Antonio López García, born 1936. Painter, sculptor, photorealist. 'Post surreal apparition paintings' - highly regarded but not prolific artist much admired by difficult to please Aussie art bloke Robert Hughes. A seriously sought after art book, no copies on web and presumably every copy that comes up sells, some possibly at effoff prices. Who knows its real value, your guess is as good as mine etc., possibly that of a roadworthy used car, can't speculate much more than that. Sizeable art book. Rizzoli don't do flimsy. STOP PRESS. Above was written in January 2007. This is a book that can now be found albeit at a price. There are now 3 copies on the web at $1750- $2100. Apparently the book is massive in size ( 13.5 x 12.5 x 1.5 inches) almost a doorstop.One dealer quotes from the d/w blurb-- "...forerunner of the realist movement centered in Madrid, Antonio Lopez Garcia"s work is among the most personal and intense to have appeared in post-war Spain. This book is the first to present all of his known work, and offers the most complete examination of his achievement to date..." I am not sure how long these copies have been there but I suspect that the book would sell fairly readily at $1300 and that $2000 is the 'stopper' price. Pat and Gerry? They were a couple of collectors/ runners/ flaneurs who hunted down books and occasionally ran them. The writer/ dealer Iain Sinclair wrote about them and befriended them. At one point they decided to find all the books of Maclaren Ross, the Fitrovian writer. The fearless duo asked for his books in every shop in London and the outskirts. At the time they were the only known punters for his work (about 1980). After a while they found they couldn't buy his books because they had created what appeared to be a demand for his works. In fact by the late 1980s there was a considerable collecting cult around him, so Pat and Gerry were as ever ahead of their time. The same thing happened with the novelist John Lodwick and the poet ASJ Tessimond, except that in their cases the demand did not significantly materialise or spread. Below is a photo of the cover of this much wanted art book. This needs to be reprinted. I saw his work in a book at the school library at the Rhode Island School of Design and was blown away. Hard to believe they're so many art books out there whilst this is out of print. I own the Spanish version of this amazing book (printed in 1989 by Lerner&Lerner). In my small home market I personally know about ten people (most of them artists) who would contemplate donating a body part in exchange for this book and who would be first in line were it to be reprinted. It's ironic that this one is OOP whereas so much other junk that has been reprinted ad nauseum is filling the bin ends at used book stores. BTW, the Museum of Fine Arts in Boston is currently (until Aug 2008) exhibiting an Antonio Lopez retrospective. If you live in the area it is a show not to be missed, by one of the -- if not THE -- greatest figurative artists of the 20th century. I own a copy of this book. It's in fine condition, including the dust jacket. Am willing to sell below lowest price listed by dealers. So let's say $1000, but am still willing to bargain. If interested please leave contact info. saw a copy on ebay go for $500 in July 2008. They may be asking $1000+, doesnt mean they are getting it. Yes, I have a copy of this book. It is my favorite of a rather sizable library of art books. Yes, it should definitely be reprinted. Does anyone know how this other book on Lopez compares? 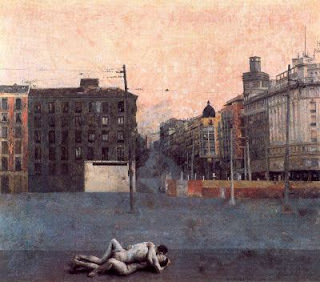 Antonio Lopez, Published by Museo Nacional Centro de Arte Reina Sofia (1993), has 358 pages. It's not oversized as the Rizzoli book, printed in Spanish, with same number of pages as the Rizzoli book. I have a copy of this book that I wish to sell for $500.00 to $700.00.